On this date in 1721, Joseph Hanno was hanged in Boston, Massachusetts for the murder of his wife, Nanny. He’d killed her “in a very barbarous manner” on November 10 the previous year: while she was getting ready for bed, he struck her twice in the head with the blunt end of an ax and then slit her throat. He made a feeble attempt to pass the murder off as a suicide, but the coroner’s jury was not fooled. “Could Hanno expect a fair trial in a Massachusetts court?” asks Mark S. Weiner in his book Black Trials: Citizenship from the Beginnings of Slavery to the End of Caste. In general, free black men received rather even treatment in the New England judicial system, at least at this period … They were entitled to the full range of legal rights, with the important exception of the ability to serve on juries. There also was no marked inequality between the punishments they received and those of white convicts. And though Hanno, in particular, certainly faced hostility and anger in the courtroom, in [Judge Samuel] Sewall, he was facing no irredeemably biased magistrate; in fact, years earlier, Sewall had written the first antislavery pamphlet published in the American Northeast. Weiner notes that Hanno “had no defense counsel, for at the time the institution was almost unknown.” He may have hoped to beat the rap because there were no witnesses to the murder. But the jury convicted him and the judge pronounced the sentence of death. Ultimately, Hanno himself admitted his guilt. Hanno had been brought over from Africa on a slave ship as a child and grew up in slavery. He was freed in 1707, when he was about forty years old, and then settled down in Boston with his wife. 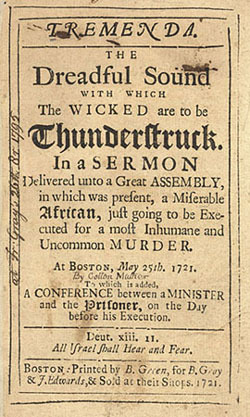 hoped that all Mankind would take warning by him to keep themselves from committing such Sin & Wickedness as he was guilty of, particularly, Sabbath-breaking and willful Murder, the one being the Ringleader to the other, for which last he was justly Condemned, which had he not been guilty of the first he might probably have never committed the second. An aside: although he may have been the only person executed that day, Joseph Hanno didn’t stand alone on the gallows.